When recruiting for a role, typically a job description or specification (Job Spec) is developed. Once the role is filled, the Job Spec is put in a drawer to gather dust. All too often, they are developed because someone insisted you cannot recruit without one so you find an existing one and mostly add to it, re-using much of the existing content. The elements included within a Job Spec are exactly those included within the Micro Design process we advocate in Organizational Design. 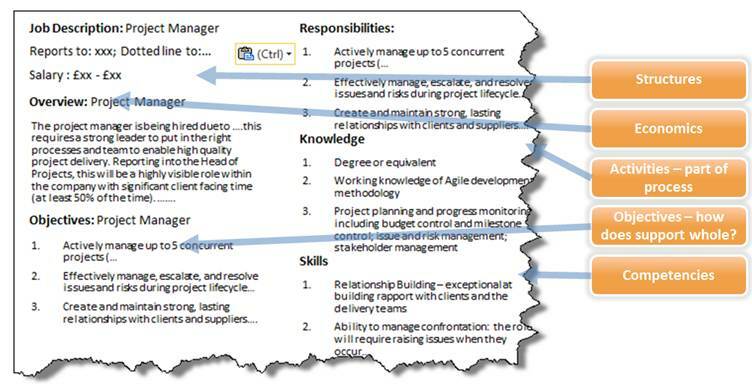 In fact, the Micro Design is each of the elements of a Job Spec pulled together into a single document. Activities and who is responsible for what? When discussing role development with a group of MBA students (as part of an OD training) last Monday, one of them commented that the company he worked for recently ran a process to understand what everyone did within the sales department. It transpired that a large number of the activities were not captured in any job specs and added up equivalent to 15% of the entire workforce. This is not uncommon, as evidenced by any number of individual activity analyses (IAA) we have conducted. What is concerning however, is being clear about what should people be doing and what is not being done? If a pay & grade review is done, how do you even start to think through the various roles in this context. As the organization evolves, the roles evolve? Do you want to understand this and plan for it, or just let it happen? As the organization evolves, do the roles evolve? Do you want to understand this and plan for it, or just let it happen? Meaningful role design should be part and parcel with meaningful Micro Design. It requires thought. But the benefit of getting it right is a more aligned, fit for purpose organization.